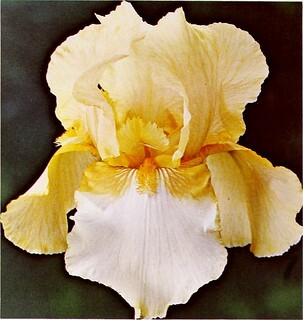 ROSE KINGDOM (Wills, '66) M. 34" $10.00 This is one of Wills rose-toned Iris. The flowers are wide and flaring with some ruffling. Classed as a rose-pink, well branched, sturdy stalks and heavy substance. ROSES IN SNOW (Noyd, '67) ML. 34" $5.00 C lean snow white, with a beard of almost blood red! The contrast is really startling and this Iris is so nearly perfect in every way that few, if any of the whites with red or tangerine beards actually equal it. Huge in size, with lacy petal edges. HM, '68. ROUND DANCE (Wills, '70) M. 34" $10.00 Rose-red bitone, standards light rose, flushed bluish, falls bright rose-red, some rulfiing, tall and well branched. Proven a good parent. HC, '69. ROYAL HERITAGE (Luihn, '68) EM. 36" $10.00 Rich royal purple intensified by the velvety texture and heavy sub- stance. Matching beard. Beautifully ruffled. Standards domed; falls wide and flaring. Strong, well branched stalks. HM, '69; AM, '72. Shown on page 10. ROYAL TAPESTRY (Schreiner, '64) ML. 38" $3.50 A deep blend of red, bronze, copper and violet, lavishly beautiful and imposing in appearance. Of giant size, the ruffled flowers ex- hibit a regal richness and an ember-like glow. Ruflled petals; excellent branching. HM, '65. See back cover.